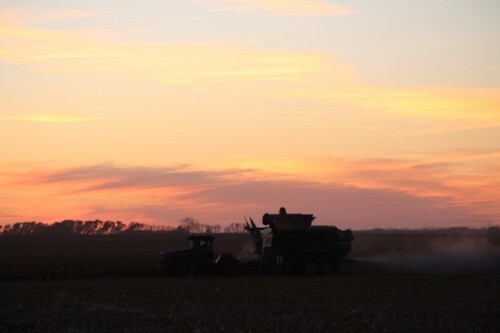 The harvest took us back to North Dakota, with cases in Ellendale and Grace City. Rain in Ellendale brought the crew members to Fargo to help set up for our annual banquet tomorrow! The crew in Grace City dodged the rain long enough to finish their job, so washed up and brought the equipment to Fargo as well for the banquet. What a reunion it will be tomorrow night, with Senator Hoeven as our keynote speaker, and volunteers, farm families and sponsors coming together for a meal and fellowship. Our trucks and crews are seeing the miles fly by as we reach out past the ND state lines. The weather is cooperating! 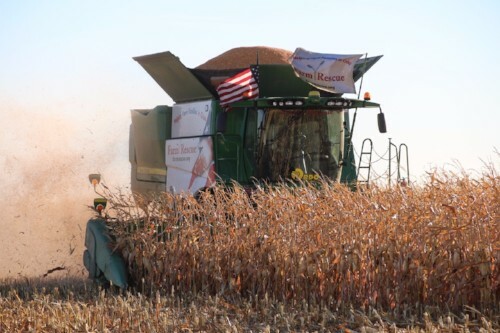 We got the second combine set up for soybeans, and between both crews have helped families in Pierpont, SD and Bertha, MN, and we are just starting with assistance in Wannaska, MN and Clarkesville, IA! Each of these families have their own story of crisis and how they are overcoming their challenges: a kidney transplant, seizures, ALS, heart surgery… The farmers are our inspiration! When the sun shines, we move! 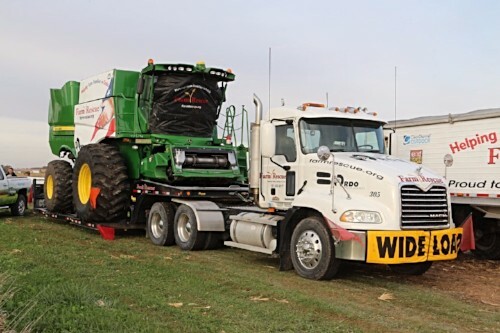 Both combines joined up for a while in Douglas to help knock out the year’s last wheat case, and then split ways again to get started on the soybeans. 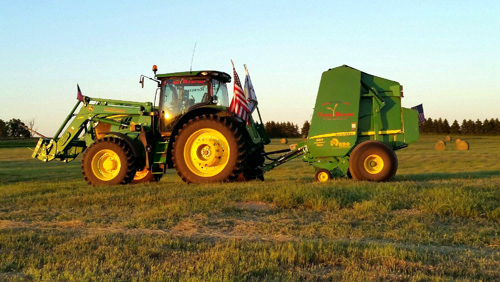 We reached a big milestone this past week as well - assisting our 400th farm family near Wheatland, ND. The media showed up and supported Farm Rescue through their footage and broadcast of what we had accomplished. What an honor it is to be able serve the farm and ranch families of the upper midwest. And this would not be possible without our sponsors and supporters. Thank you! 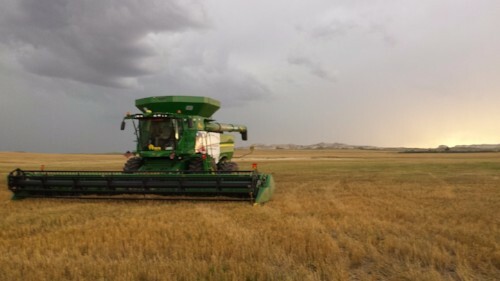 Wet weather, go away, come again another day… We had a few dry days to help a Willow City, ND farmer get his wheat out, and then it rained again. We are encouraged by the volunteers who patiently wait out the bleak weather for the reward of providing assistance to someone in need when the sun does shine. Thank you! 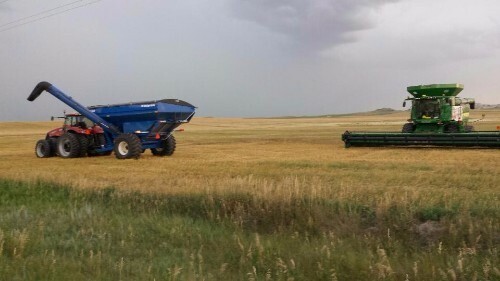 Wet weather has prevented combining the last little while, but crews remain eager and ready for the wheat to dry enough to do some harvesting for families in crisis! 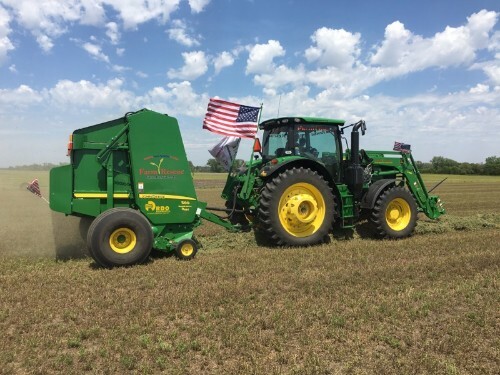 Though the combines might sit for a while, volunteer Will Rudolphi made a Hay Assistance trip, taking hay to three farmers in need due to the drought and severe weather this summer in Western North Dakota and Southeast Montana. The relief was felt as the hay rolled in. When mother nature decides to unleash fury, it's hard to keep operations going. Farm Rescue is able to assist in these cases and in Cando, ND, that time was this week. 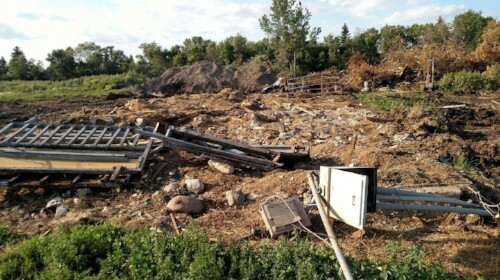 The Kurtti family, heard on the radio that a tornado was on the ground in the general vicinity of their farm and when they arrived, they discovered total destruction of their home, buildings and equipment damaged beyond recognition. Farm Rescue Volunteers Kyle Thormodson and Charlie Bailey were able to arrive in the nick of time and begin baling while the Kurtti Family started to pick up the pieces and rebuild stronger than ever. 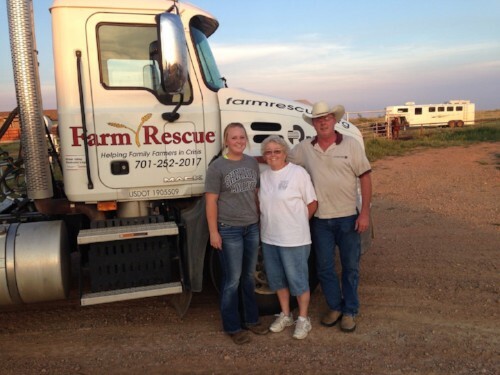 Farm Rescue Volunteers sprang into action this week as they assisted a family in Amidon, ND. Volunteers, Phil Jung, Brandon White and John Robertson drove equipment from Breckenridge, MN to Amidon and were able to get off loaded just in time for a small rain shower. In the farming world, we never curse the rain as it can always stop. Farm Rescue has added a new program in which we will take donations of hay and transport that hay to a ranching family who is also in need. 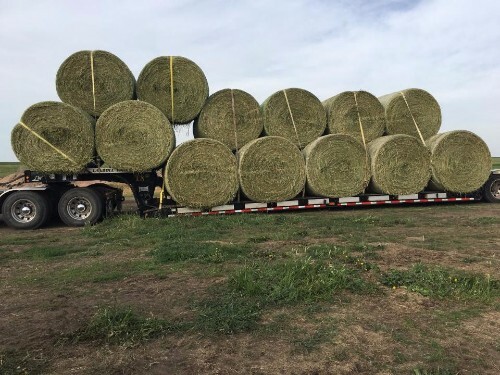 Volunteers Charlie Bailey and Gary Krieger were able to haul loads of hay to families in Baker, MT who have suffered catastrophic drought and hail. 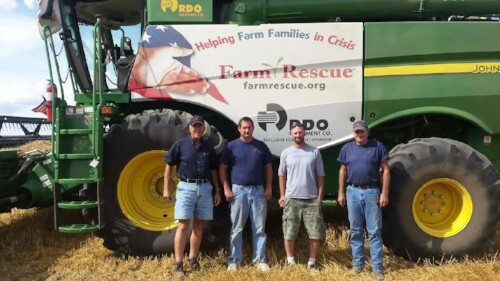 It's an exciting new way in which Farm Rescue can assist even more families in crisis. Volunteers Charlie and Pat Bailey and Will Rudolphi assisted family in Scobey, MT. Farmer fell from his haying wagon and was injured. Sky in Montana is most definately big! Ahh, the smells of summertime. Fresh hay being baled fills the air. This week, Volunteers William Rudolphi (Champaign, IL) and Charlie and Pat Bailey (Earth, TX) moved the baler to Wolford, ND to assist a farmer who suffered some injuries during a traffic accident. Thank you to all the great volunteers who give of their time and talents to assist a total stranger in a time of need. These volunteers and families are not strangers long as many become friends and stay in touch throughout the years. You'll never forget these times and the great memories made. 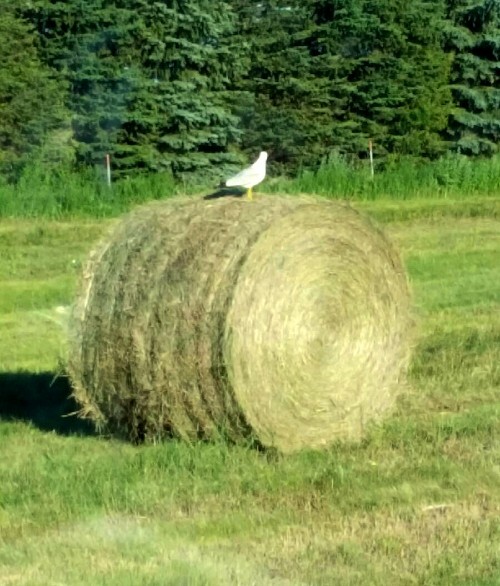 Mr. Gull inspecting the job that Keith Barkema (Klemme, IA) is doing while assisting a family in Granville, ND. Also, possibly ready to swoop down and gobble up a grasshopper maybe? Volunteers Charile and Pat Bailey (Earth, TX) and Lee and Shirley Krump (Battle Lake, MN) assisted in Washburn, ND this week. Farmer was severly injured while checking his cows and is currently in the hospital recovering from his injuries. 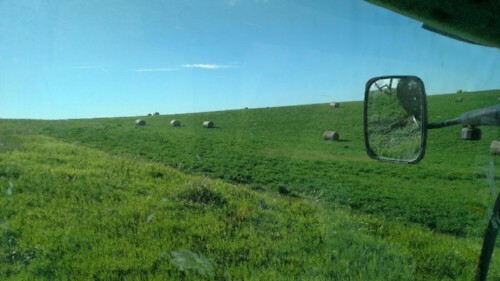 Charlie happened to be in the right place at the right time and met the spouse of the injured farmer, described Farm Rescue's operations, and with their approved case, Farm Rescue was able to assist in swathing and baling hay for their cows. 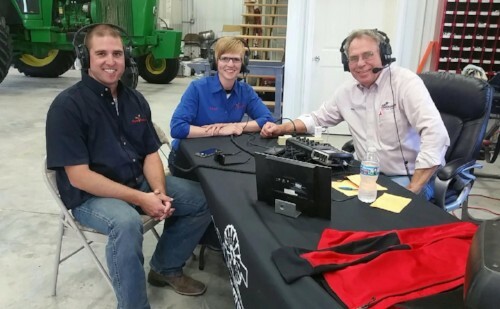 Busy week for volunteers Levi and Carol Wielenga (Sioux City, IA), Charlie and Pat Bailey (Earth, TX) as they prepared the tractor and bailer in Bismarck, ND. They used the lowboy semi to transport the baler to Howard, South Dakota to assist the Kevin Schwader family. Kevin was injured while checking his cows using his ATV. Typically, when you see a fireman squirting water on a tractor, you'd think maybe a fire was being put out. In this case, that is not what's happening. 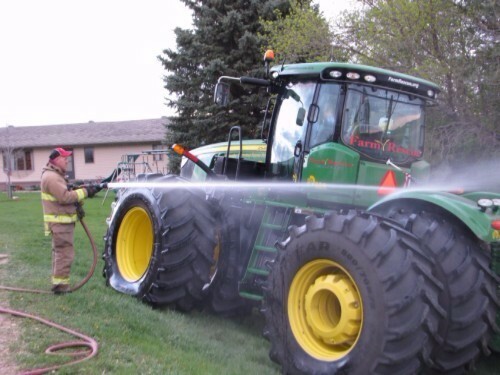 When Farm Rescue is nearing completion of the planting season, volunteers work with local volunteer fire departments to come out to the farm to help clean the equipment. It provides a much needed service to Farm Rescue as well as training for the local volunteer fire department. Rugby, ND volunteer fire department was gracious enough to assist in cleaning the equipment in preparation for maintenance and display of our equipment. Thank you volunteers! Been a very productive week for the volunteers of Farm Rescue. Dryer conditions have made it possible to complete many cases. Kenneth Chyle (Auburn, KY), Emil Baranko (Waukegan, IL) and Lee Van Ruler (Sioux Falls, SD) were able to complete Max, Turtle Lake and are now in Garrison, ND. 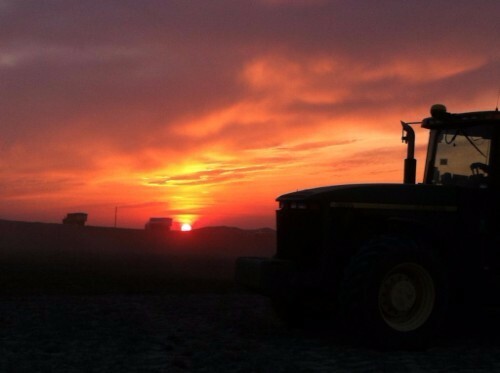 Duane Wentland (Rice, MN) and Steve Bemboom (Foley, MN) completed planting in Lindsay, MN and provided this weeks photo above. Patrick Marrinan (Polson, MT) planted in Beach, ND. A huge thank you to these great volunteers who give of their time and talents to assist so many families. 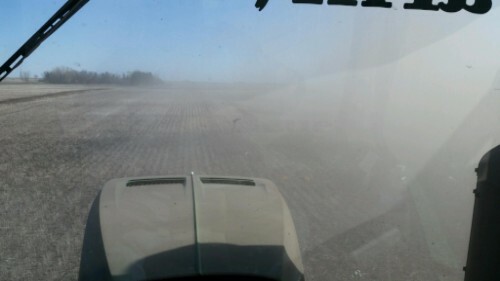 After many delays due to rain, this dust is a welcome sight. Volunteers Ken Chyle, Emil Baranko, and Lee Van Ruler were able to get underway in Makoti, ND planting spring wheat and flax for the Byron and Sheilah Scheinfish family. Tanner Millang, Clay Robertson and Charlie Bartsch were able to plant in Parshall, ND. Planting wheat for the Anthony Kautt family. Volunteers worked in Hazen, ND, Parshall, ND, Kief, ND, and DeSmet, SD to plant, as mother nature provided some much needed rain in the region. This past winter has been dry so the rain was a blessing, but hampered planting. Volunteers spent the week setting up equipment and preparing for the 2016 Spring planting season. Farm Rescue has received a number of applications and expects to be very busy this spring.